Let me tell you about ROM and me. ROM was one of those little gems of a series that lasted a pretty long time but no one noticed. He was based on a toy that never really took off (but recently showed up on Robot Chicken, so perhaps ROM's time has finally come!) but managed to land a Marvel Comics series that ran 75 issues and four annuals. 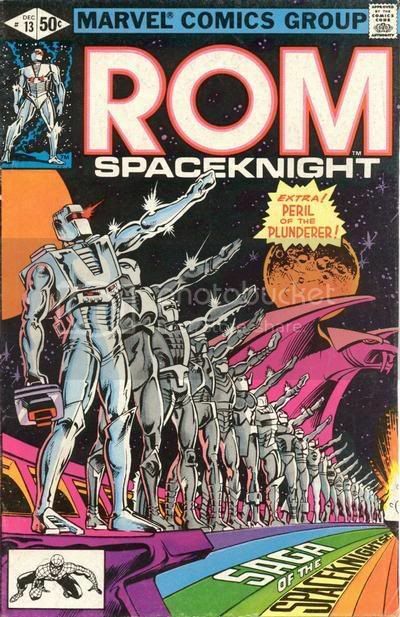 There was also that ROM-less Spaceknights mini written by Starlin a while back, but it's considered to be awful, and Starlin admitted that he only wrote it so that he could fix up his boat. The original series, however, was great. Written by beloved Bill Mantlo and drawn by such greats as Sal Buscema and Steve Ditko, and yes, I'm heaping praise on these gents without a hint of irony. I love their work. ROM was a Spaceknight from Galador, and ended up on Earth to banish Dire Wraiths, disguised as humans, with the aid of his Neutralizer, a laser gun that would send them to limbo (but let's not forget his Analyzer and Universal Translator). Foolish Earthlings, however, thought he was a mad robot that killed random people, for they knew nothing of the Wraith menace. Eventually, he won. Or something. I never did get to read many of the later issues. Yeah, it's a silly premise, but the comic, and the character, had a lot of heart. 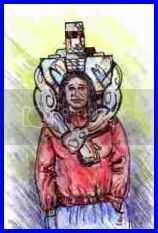 ROM was the noblest hero since the Silver Surfer. 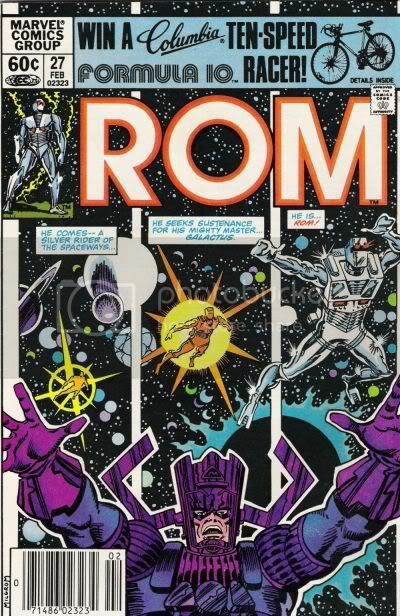 After the series ended, ROM has popped up now and then (he was a guest at Rick Jones' wedding), but Marvel no longer owns the rights and the actual character of ROM can't officially show up. I'd love for them to get the rights back, even if it was only to print an Essential ROM (much like their deal for Essential Godzilla). A new ROM series would make me a happy blogger, but I'd probably die from shock. And it'd probably last six issues in today's market. And whoever started those rumors about ROM being a Nazi were dead wrong. Wrong, I say! But he is, apparently, Galactus' forgotten herald. ROM is/was awesome. You should love him. And you should love comics.